An unseasonably mild 17.6C was recorded in London on Saturday, while the Met Office believes Friday into Saturday was likely one of the warmest February nights on record with 14.5C recorded at Achnagart in Scotland. The mild weather is a marked contrast to the low temperatures and snow brought by the Beast from the East just 12 months ago. 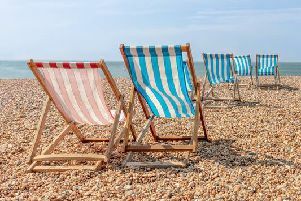 Met Office meteorologist Emma Smith said: "These conditions are going to be continuing until Tuesday and then on Wednesday it starts to turn a little bit cooler in the North West, but certainly eastern and southern areas are going to still be quite mild." She said temperatures of up to 18C could be felt on Monday and Tuesday. "London, for example, should be 9C at this time of year. Inland Wales should be 6C or 7C, around the coast of Wales it should be 8C. "Northern England should be around about 5C to 7C - 5C inland, 7C around the coast. "Northern Ireland 7C or 8C, Scotland, generally around about 6C to 7C, around the coast and inland. "So obviously some places seeing temperatures 10 degrees above the average." The warmest February day in Scotland was recorded this week when Aboyne in Aberdeenshire hit the maximum temperature of 18.3C on Thursday afternoon. It beats the previous high of 17.9C recorded in Aberdeen on February 22, 1897. The maximum temperature of that day nearly 122 years ago was matched at 12.23pm and by 1.39pm the mercury had risen another 0.4C.